Australian-imported V8 muscle sedan is almost gone. It won't come back. Like many of you, we were thrilled when Chevrolet launched its V8-powered, RWD SS sedan for the 2014 model year. Designed, engineered, and built in Australia, really the only other country aside from America with a V8 muscle car obsession, the SS is coming to an end because its Holden VF Commodore twin is also getting the axe. Following its ’16 model year updates, the SS returns for 2017 unchanged and if you want one, act fast. GM Authority believes that February (holy crap, this month!) will be the final month to place an order for one. Chevrolet, more than likely, will choose to quietly phase out the SS, and we haven’t heard anything about a special Final Edition, or something like that. Because SS sales have typically been quite slow, Chevrolet offered a 20 percent off MSRP discount last July. Don’t be surprised to find similar savings available today. In any case, its return to life may have been short following the Pontiac G8's own departure, but the SS was great while it lasted. Sure, it’s not as fast or powerful as the Dodge Charger SRT Hellcat, but it’s also a lot less expensive. Try $46,625 vs. $67,645. On the other hand, that’s 415 hp vs. 707 hp. 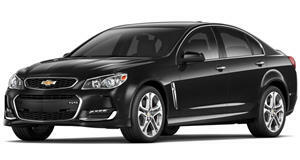 But a RWD, V8-powered full-size sedan is a dying species, and the Chevrolet SS is proof, sad to say.